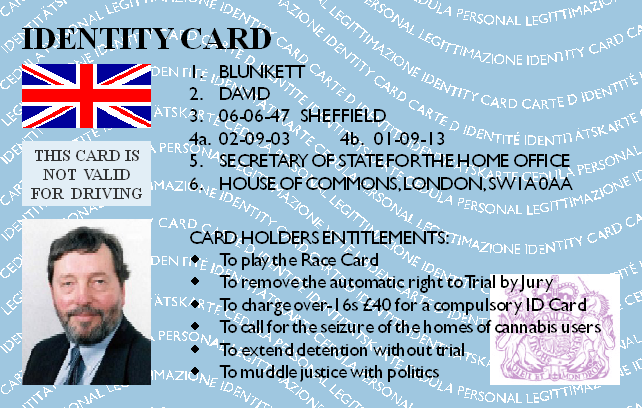 The government is predicting that some 15m people will revolt against Tony Blair’s controversial ID card scheme by refusing to produce the new cards or provide personal data on demand. I read this little gem hidden away in the corner of my Sunday time's, almost as if they did not want any one to notice it, so I thought I would put it up here and find you a link to the web site. Personally I don't think ID cards are worth it they wont stop a thing and will just make criminals of us all, we need a poll tax style revolt to put them in their place, and get the government to abandon this idea.